Be good to your party guests on diets, and serve them a tasty patriotic yogurt parfait. No food coloring or added sugar required. After all, blueberries and strawberries are naturals for July 4, but not everyone wants to eat them on top of a flag cake! 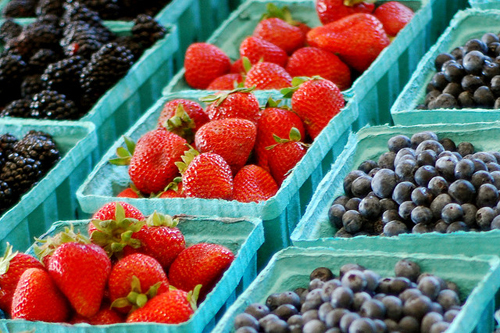 Shop for fresh berries at your local farmer’s market. Image by Rhett Maxwell. Make your healthy patriotic parfait by layering the ingredients in a clear glass. Juice cups are perfect for this. For example, start with granola, and then add yogurt, blueberries, more yogurt, strawberries, and finish with a sprinkle of granola on top. If you’re feeling naughty, substitute white chocolate chips for the granola!